Unfortunately, many women experience depression at some point during menopause. During this shift, a woman's body goes through drastic hormonal changes that affect physical and emotional state. Most notable is the drop in estrogen, which is strongly tied to brain chemistry. Luckily, there are steps you can take to manage your symptoms. Learn more about some of the do's and don'ts for treating depression. While working out can seem daunting, it is one of the best ways to treat mild to moderate depression. Specialists suggest 30 minutes of physical activity five days a week. This doesn't have to be a monotonous run on the treadmill - it can be dancing to your favorite music, taking a brisk walk in the park, swimming, or anything you like, as long as you are active. Many women also find peace of mind through practicing yoga once or twice a week. 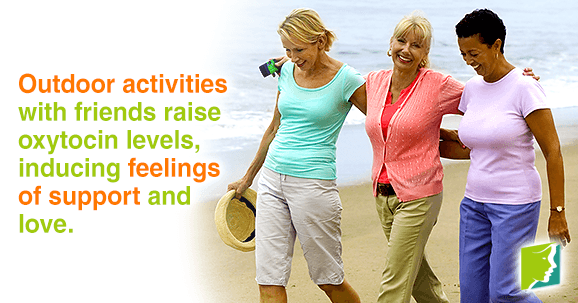 These activities produce serotonin, endorphins, and gamma-aminobutyric acid, which can curb depressive symptoms. People who are depressed have a tendency to withdraw from the world. However, going outside and enjoying nature is a much better option for treating your depression. The sights, sounds, and scents are always changing and can be comforting. In addition, a deficiency in vitamin D - which your body produces when it's exposed to the sun - may increase the risk of depression. Preliminary research shows that vitamin D supplementation could help alleviate depression in some cases. Outdoor activity is even better if you can go out with a friend, as companionship raises oxytocin levels, inducing feelings of support and love. Individuals who suffer from depression are more prone to unhealthy eating patterns. Either they will not eat enough, and when they do it is unhealthy, or they eat fatty, sugary foods in excess. Eating packaged chips, fresh-baked desserts, pizza, and soda may distract you from your sadness at first, but it is only temporary. Therefore, it is important to eat a balanced diet of whole grains, colorful vegetables, nuts, fruits, and lean proteins. Eating a nutritious diet can go a long way in improving your overall well-being, including your mental health. Depression is a complex disorder, and in many cases, antidepressants are only one piece of the solution. Often, treatment is accompanied by counseling, also known as talk therapy, to help guide patients through this difficult time. A common herbal supplement in Europe for treating depression is St. John's wort, which can be helpful in some cases of depression. Your doctor or psychiatrist can help you decide which combination of treatments is most effective. Dealing with depression is hard, as it is an intricate illness with many influencing factors and treatment options. Although it can feel hopeless, there is help available, and you do deserve it. Other menopause symptoms may compound depression, but there are things you can do, starting with small lifestyle adjustments and seeking the guidance of your physician. Depression can be a symptom of menopause. Click here to learn more.